Why can the hardness difference (CFDCompression Force DeflectionCompression Force Deflection /ILDIndentation Load Deflection) between the main and side bolster area NOT be of any size? Is it possible to have a significant difference in density? What are the limits? The hardness gap between the main panel and side bolsters area is driven by the technology, the type of formulation and part design. When the 'physical' separation between soft and hard areas in the parts (deep bolsters, deep trench line) is properly defined, the possibility to reach higher hardness gaps is increased. Both soft and hard foams are kept at the pouring place and not flowing to other areas.In parallel, maximum hardness in the bolsters is linked with the process range of the formulation at a given density. Why does the IFDIndentation force Deflection measurement between two different seats of the same density and CFDCompression Force Deflection differ? How can you describe the correlation between ILDIndentation Load Deflection / CFDCompression Force Deflection related to geometry of the part? When testing several parts with the same geometry/design, ILDIndentation Load Deflection results show variations within the ILDIndentation Load Deflection tolerances defined for the product. These variations are linked with the raw materials used, process variations, testing conditions and machines.When testing parts with different design at same density and ILDIndentation Load Deflection, results can not be compared. ILDIndentation Load Deflection results are obtained by compressing parts to a special depth corresponding to a % of the original thickness of the part. Compression rate, and therefore load value, are then different with different thicknesses/design. If the ILDIndentation Load Deflection changes by x mm, why doesn't the H-point change accordingly? The H-point is measured on the complete seat built with metal structure, suspension mat, foam pad and cover material. Each element is contributing to a certain extent to the H-point variation. ILDIndentation Load Deflection change (in mm) or thickness reduction of the pad in Z direction can not directly be transferred to a new H-point measurement. How can CLDCompression Load Deflection Hardness be measured exactly for thin parts? For thin or complicated parts (with aeration holes, trench lines, ventilator areas, ..), it is impossible to cut CLDCompression Load Deflection samples with the correct size. Some OEMOriginal Equipement Manufacturer specifications are requiring superposition of foam layers cut from several or similar parts in order to reach the correct requested thickness for the test. This superposition is adding an additional parameter for the CLDCompression Load Deflection results variation and tolerances for thin parts must then be defined more broadly. What are the general tolerances of foam parts? Tolerances / accepted variations for foam parts are set by customers (OEMOriginal Equipement Manufacturers). They may vary from one customer to another. Why do we need ±10% IFDIndentation force Deflection/CFDCompression Force Deflection tolerances? For many years it has been an accepted fact in the industry that hardness dispersion in a moulded foam requires a +/- 15% tolerance. A study by Euro-Moulders in 2007, demonstrated the need for such a tolerance due to variations in raw materials, accuracy of testing methods and other influencing effects such as temperature, part geometry, pour patterns... For some designs, a tolerance of +/- 10% may be achievable. Why is the coloration of hardness zones not an efficient tool for quality and/or process control? (Partial) coloration is useful to avoid the mixing of references as foam parts may look very similar. But it is not considered to be a sufficient tool for differentiating hardness zones for quality or process control, as it does not reflect how the separation between the different zones is inside the foam part. Also separations between different zones is never 100% clear cut in dual hardness foams as there will be areas of overlap where the two types of foam come into contact. Is it possible to produce low hysteresis foams in a broad range of density and hardnesses? Improvement of one foam property in one direction (lower hysteresis) will have an effect one other properties. This can be a switch of density range or hardness range or a degradation of some mechanical properties for example. Having a multi-component machine able to pour several formulations in the same cavity might help to increase the process window but each single formulation has its own limitations. How can the weight of foam parts be reduced? What are the difficulties linked to fulfilling OEMOriginal Equipement Manufacturer demands for low density foams? PU foam being a plastic material, OEMOriginal Equipement Manufacturers expect in their specifications that moulded foam parts are durable and set very strong ageing requirements. PU foam is showing very good properties over time in a realistic density range and is not performing the same way when densities are pushed to the lower limits. PU material used for automotive seats is a material with already low density. Depending of the technologies, foams are produced between 35 and 80 g/l. At 50g/l, only 5% of the volume is filled with PU material, 97% is air. Is there an recycling concept in place for used PU-automotive seating parts? What is the influence of water or water vapor absorption of a seat to physical properties and/or comfort? The hardness of foam changes with the level of humidity. Therefore, all tests must be performed in a controlled climate room. Higher level of humidity is softening the foam. Foam is harder at low humidity. What is the difference between hot cure foam and cold cure foam? There are a lot of differences between the two processes. Pouring head, race track, moulds, formulations, raw materials are different for example. Density range achievable is also different, being able to foam at lower density . For more information please refer to Euro-Moulders' Guide on "Moulded PU Foam for Automotive Seating", pages 25 to 27 and 41. 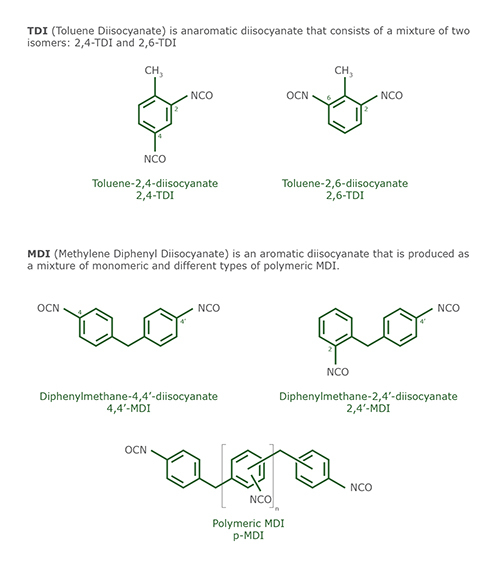 What is the difference between MDIDiphenyl diisocyanate and TDIToluene diisocyanate? MDIDiphenyl diisocyanate and TDIToluene diisocyanate are 2 different types of isocyanates which can react with polyol blends. Their chemical structure is different, polyol blends are also usually different. PU properties and behaviour of both technologies are also showing some differences. For more information please refer to Euro-Moulders' Guide on "Moulded PU Foam for Automotive Seating", page 15. What is the difference between core-density and global density? Density is a property suitable for the characterisation of a material, which is neither dependent on the shape of the part tested, nor on the test methods used. Core density is measured on a cut sample. Global density is the total foam weight divided by the mould/part volume. Core density values are lower than global density values. For more information please refer to Euro-Moulders' Guide on "Moulded PU Foam for Automotive Seating", page 32. What is the heat resistance of flexible PU foam? What are the density ranges for different foam technologies (cold cure vs hot cure)? 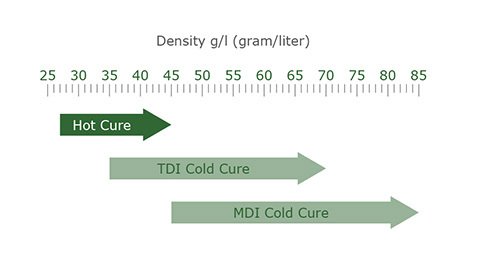 Hot cure foams achieve densities of 27-45 g/l while cold cure technologies are in the 33 to >85 g/l range. For more information please refer to Euro-Moulders' Guide on "Moulded PU Foam for Automotive Seating", page 32. Why is increasing the density and lowering the CLDCompression Load Deflection not possible? Where are the limits of high density and low hardness? The hardness of PU foam is linked to the water level of the polyol blend, to the ratio polyol/iso (index) and to density. It can also be linked to the isocyanate type. The CLDCompression Load Deflection can be kept low playing with all these parameters. Once Index and water are set at the limits of the process range, then a density increase is automatically increasing the CLDCompression Load Deflection. Other process blocking points can also be observed. This means that foam parts at very low index are usually very tight and are difficult to open mechanically. This can result in some design deformations in difficult areas (shrinkage). Low index is also impacting mechanical properties. Which are the criteria to decide between cold cure TDIToluene diisocyanate and MDIDiphenyl diisocyanate? What is the criterium for usage of hot cure technology? Density can be a reason to prefer one technology instead of the other. In the same density range, it can also simply be the OEMOriginal Equipement Manufacturer's wish or specifications. Is TDIToluene diisocyanate based cold cure foam cheaper than MDIDiphenyl diisocyanate? Why is the cost of a PUR part not correlated to the weight of used foam/chemicals? Why is hot cure not comparable to cold cure by cost? Like all goods, the price of PU foam parts depends on many different factors. The density of the foam and formulations selected, which have a direct impact on the amount of raw materials used, play an important role for PU foam parts but are not the only ones. It is therefore not possible to state across the board that one type of foam is "cheaper" than another. What is gas loss and how high is it? 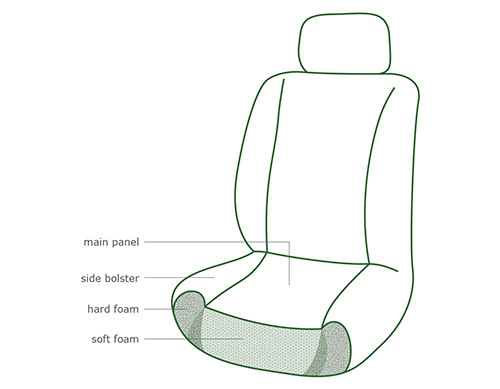 As described in our document "Getting to understand moulded PU foam for Automotive Seating", foam expansion is due to the generation of CO2 insitu during the formation of the foam. This generation of CO2 consumes some amounts of isocyanates, which are therefore not available anymore for the polymer reaction / creation of polyurethane. This "gas loss" can be calculated as a function of the used foaming technology (Hot Cure vs. Cold Cure) and the raw materials used and formulations. Why are low emission formulations more expensive? Raw materials come at a cost. Additives used to control emissions of low emission foams influence the cost of such foams. Why is it not possible to achieve the same tear propagation strength results with TDIToluene diisocyanate and MDIDiphenyl diisocyanate foams? TDIToluene diisocyanate and MDIDiphenyl diisocyanate are both isocyanates with different chemical structures. The corresponding foams have different intrinsic physical properties, mainly related to the polymer structure itself. A lot of physical properties of MDIDiphenyl diisocyanate and TDIToluene diisocyanateHR-Cold Cure FoamsHigh Resilience can be similar, a few are intrinsically different. Tear propagation strength is one of them. Can I foam a MDIDiphenyl diisocyanate part at 35g/l? Why not? It is technically possible to foam an MDIDiphenyl diisocyanate part at 35g/l. But, the density of the foam is a strong determinant of its physical properties. The reduction of density will have a significant impact on the durability of the foams. The specification in terms of durability usually in turn determines the limitations for density reduction. Why are the low emission catalysts degrading foam properties? Low emission catalysts as their name states help controlling emissions from the foam. But they also act as depolymerisation agents during ageing of the foam (heat, humidity). For more information please refer to Euro-Moulders' Guide on "Moulded PU Foam for Automotive Seating", pages 39 to 40. What is the impact of the mould's temperature on hardness variations? The temperature of the mould influences the nature of the skin of the foam, i.e. the aspect of the foam pad, and not the hardness itself. The influence of the thickness of the skin is negligible during the hardness test where a sample is deflected at 40% (or more) of its initial thickness. Why is it difficut to foam thin sections over a long distance? What are the restrictions of foam thickness in relation to the geometry of parts and meeting specifications? Minimum design guidelines must be agreed in advance between designers and foamers. Moulded PU foam parts take the shape of the mould they are produced in. The mould cavity must therefore allow for enough space for the material to flow into all sections of the mould without losing stability. Also, as gas is generated during the chemical reaction, the gas must be able to escape before blocking the flow of the growing foam. Why is it not possible to produce parts with large undercuts? What are the limits? To be able to produce parts with a back flap (undercut), as is typically the case for front seat backs, it is necessary to use special moulds called 'three-parts tools'. Because of the cynematics of these moulds on the production lines at the demoulding area, there are size limitations. In addition, the foam is not poured into the undercut section of the tool at injection. The PU material must rise and fill the flap cavity within the same reaction time as for a conventional 2-parts tool. This can create quality issues. The thickness of the undercut must stay within typical tool guidelines as very thin flaps will contribute to the destructuring of the foam and to the presence of voids in the flap area. What is the typical "cure Time" for flexible PU moulded foam? What is the typical time between demould and storage and upholstering the foam in the seat to avoid pressure stamp-marks? The typical curing time of a PU foam part depends on the density and hardness of the foam. For typical seat pads, the curing time is a few hours. It is accepted that the foam can be integrated into a seat after 24 hours. However, according to test procedures, the final physical properties of the foam are reached after 72 hours. Even cured foam can show stamp marks after wrong handling. Why is hardness separation in dual or multi hardness parts not possible or not reproducible? Why is dual hardness difficult in thin parts? The foaming process starts with pouring the liquid reaction mixture into the mould. 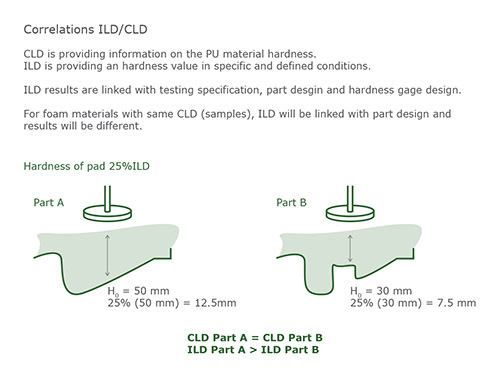 Different hardness zones can only be obtained by using different PU liquids. It is well accepted that liquids have to be separated physically to avoid the mixing of both. After the chemical reaction has started, the viscosity of the resulting polymer increases. This offers a limited option of fully separating both hardness zones. The only existing option guaranteeing a 100% clear separation is to design and produce separated parts and combine them after the foaming process. Why are there more defects or air voids in some areas (B-side) than on others? Is it not possible to eliminate such air voids completely? During the foaming process, PU material is injected directly to the A-face (= future upper face) of the parts. Complex pouring patterns are used to apply materials on the greatest possible surface of the tool's A-surface, to avoid voids in the foam's A-side. During the foaming reaction, foam is rising and reaching the B-face of the tool. Air trapped in the mould must escape from the mould to avoid voids. This can be achieved by design of the B-face of the moulds. Complex cavities will require special venting which can create issues. What influence does the shape of the foam part have on its physical properties and/or pressure distribution? The shape of the full part will have no specific influence on measured physical properties as these are carried out on standard samples cut in the part. But it will have an impact on the felt comfort or pressure distribution of the car seat. This is to be considered on a case by case basis also taking into account the seat design. Generally, thicker foam parts are considered to provide greater comfort than thinner ones. How thin can a foam part be produced? Are there limitations to meet specifications related to part thickness? Foam producers have design guides for the thickness of parts. These must be taken into account to avoid quality issues with the parts. While thin designs can generally be produced, one has to note that the thinner the design, the more difficult it will be to measure ILDIndentation Load Deflection on parts . It will also be more difficult to cut samples from the given parts for mechanical properties testing (samples sizes not according testing specification). Most importantly, for very thin parts, the comfort and durability brought by the PU materials are strongly reduced, which makes testing irrelevant as the samples tested would fail the test anyway. What are realistic figures of material losses during production (such as gas-loss, trim waste in cold cure or mushrooms in hot cure? It is not possible to provide a general figure to answer this question. Material losses are strongly linked to foaming technology and chemicals used. Low density foams for example create higher gas loss compared to high density foams. Difference between hot cure and cold cure come from the specifities of the process. There need to be vents and possibilities for off-gasing in the hot cure technology, this is inherent to the process. Why do we not control humidity on tank farms? The industry operates following the principles of the guidelines for the safe loading, unloading, transport and storage of TDIToluene diisocyanate and MDIDiphenyl diisocyanate in bulk issued by the European Association of Producers of Diisocyanates and Polyols (ISOPA) available at www.isopa.org. These guidelines do not require humidity measurements in the tank farm, simply because humidity levels in the air would have no impact on the safety of the installation. Foam producers are however required to design their tank farms in such a way as to prevent any runaway chemical reaction induced by water or any incompatible chemical entering the tanks. What is the impact of release agent on hardness variations? The thickness of the skin of a foam part is less than 1 mm. It can therefore be considered as negligible during the hardness test where a sample is compressed at 40% (or more) of its initial thickness. What is the impact of the plant geography (altitude, longitude...) on the density dispersion of a foam pad? Why are CFDCompression Force Deflection´s lower then 4kPa not achievable in seating applications? Why could such a target not be met with low hardness foams? Producing low hardness foam depends on several parameters such as foam technology, foam formulation, part design, density and CLDCompression Load Deflection test method. To reach low hardness, foamers must usually be at the limit of the production process window and are experiencing limitations. Being out of the typical material process window might have an impact on given physicial properties / other specifications. Why is the hardness distribution in a single foam part is not homogeneous? Parts are produced with adjusted pouring pattern which optimizes foam repartition inside the tool cavity. PU material is then rising and filling the cavity. It might happen that locally slightly less material poured is in one area of the tool resulting in slightly lower density and hardness. In addition, equipment used to measure hardness also have their own variations. How can PU foam emission specifications be met? Emission is a single word for several types of substances/compounds. Depending on the type of emission reduction that is requested, foamers can adapt their formulations to seek to reduce certain emissions. But it is important to note that some emissions can be due to impurities present in raw materials and will therefore be much more difficult to remove completely. Other emissions can also be linked to the foaming process itself. For more information please refer to Euro-Moulders' Guide on "Moulded PU Foam for Automotive Seating", pages 39 to 40. Why are the long-term properties of a PU foam part or the dynamic fatique test critical, specially at low densities? The physical properties of a plastic part with a given shape are strongly related to the density of the material. Massive Polyurethane has a density of approx. 1100 kg/m³ . Typical PUR-Flexible Foams used in seating applications have a density range between 40 and 80kg/m³. At a density of 50kg/m³, the foam contains 95% of air. This means that all the physical properties required from the foam have to be achieved by only 5% of its volume (the polymer part). Reducing the density to for example 40kg/m³ means reducing the amount of polymer by 25%. This will inevitably affect most physical properties in a negative way. Why is it difficult to meet Dynamic fatigue tests for thin foam parts? Testing methods are designed for reasonable foam thicknesses. Applying such tests to thin parts means they are compressed by more than 90%, effectively destroying the foam between the underlaying support and the intendor (load). There are sounds between metal and foam from time to time. What is the input of foam to this effect? How can foam avoid "squeeking"? In most instances, noise comes from the contact between 2 materials. Squeeking may be due to various reasons but often results from contact between the foam and the main covering metal parts of the seats. It can be avoided by using the correct combination of materials or with the use of an "anti squeeking" agent. What is the ‘shelf life’ of a foam part (in years)? Polyurethane foam is a long-lasting, high performance polymer. It is lasting for many years in car seats and can be stored for a long time if needed. When exposed to light, polyurethane foam will over time take a yellowish colour. But this has no impact on its physical properties. If stored with no exposure to light, such discolouration will not take place. Why does a reduction in foam density or hardness not result in an increased in perceived comfort? Reducing the hardness and /or thickness of a foam pad will lead to higher compression of the foam when someone sits on it. If the foam is compressed more than approx. 40-50% of its initial height, the foam densifies too much and feels "hard". This results in a "virtual" hardness effect, which will be interpreted as a lack of comfort by the car's occupant. It is a paradox, but the more the hardness of a foam is reduced beyond the above rate, the "harder" the foam will feel when a person sits on the pad.